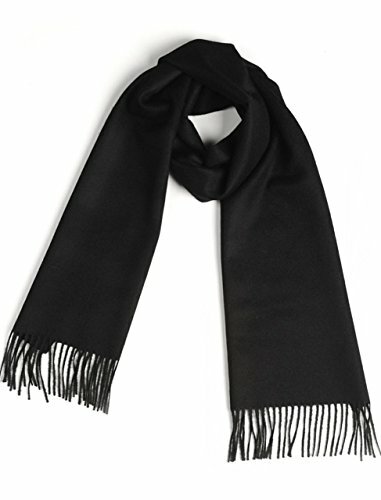 Luxury 100% Pure Baby Alpaca Scarf, for Men and Women - A Great Gift Idea in Many Colors (Black) | What Should I Say? Bundle up in cozy style with this 100% pure baby alpaca wool scarf - it is like wearing your favorite blanket - only it is feather light and the perfect size. Inca Brands sets a tone that is sophisticated and timeless at the same time. Our sought-after alpaca scarves are created from natural 100% baby alpaca, certified pure by the International Alpaca Association. (The IAA is an independent organization that certifies alpaca yarn by fineness and quality. Because alpaca is in high demand and is expensive, retailers often blend with other fibers without disclosing. The IAA is committed to communicating to consumers the true content of the alpaca goods they are purchasing. Look for their silver hologram on the hang tag, along with the retailers' ID. Inca Brands has been a part of the IAA since 2004.) Always look for the IAA certification on alpaca goods your purchase, from any retailer. Our Baby Alpaca fiber is delicately spun and expertly woven into a feather-light yet durable scarf that will chase away the chill of the coldest days. Our alpaca scarves actually soften with wear and never water spot. They don't shed or pill. Luxurious baby alpaca - sustainable and environmentally friendly, is shorn from the animals once a year with the greatest of care. It is naturally thermal, hypoallergenic and perfect for those who suffer from wool allergies. Pure baby alpaca is particularly suited to absorbing color, and these brilliant shades are wonderfully vibrant and cheerful - they will never run or bleed. Alpaca, and particularly baby alpaca, makes a treasured gift, perfect for anyone - especially those who are hard to buy for! Once only available to royalty, baby alpaca is a gift that shows just how special the recipient is. Images are color matched for accuracy via Pantone color matching system, however, we cannot be responsible for individual monitor settings and how images render. We have always utilized natural & AZO free dyes for Prop 65 compliance. Our baby alpaca wool scarves are sure to chase the blahs away in all these bright happy colors! Certified pure by the International Alpaca Association. Naturally warm & cozy, our colors will never run or bleed. Rain, snow, sleet, they won't damage or water spot this scarf! Sustainable, fairly sourced & environmentally friendly, the baby alpaca wool is shorn from the animals once a year with the greatest of care, a necessary part of maintaining good animal health. Dry Cleaning recommended for longest life, however due to the nature of alpaca minimal cleaning is needed. If you have any questions about this product by Incredible Natural Creations from Alpaca - INCA Brands, contact us by completing and submitting the form below. If you are looking for a specif part number, please include it with your message.